Aspiring architects will master basic building principles by creating their own ultimate fort. Collaboration and imagination will be integral to their success! At the start of the week, campers will survey their building site and study the design of historic forts. 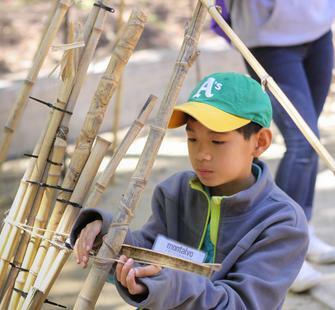 They will also learn about various methods for making use of natural materials in construction and collect supplies from Montalvo’s grounds. Then, as a team, they will plan and build their own edifice. As they work together to make their vision a reality, these young builders will master basic principles of architecture and construction, and learn how to use hand tools. The finished creation will be part of the 2016 Art on the Grounds exhibition.